I do love it when a Stampin Up order arrives. It is a little like when I used to take photos using film (remember film?) and not knowing what I have taken photographs of until they have been developed. I needed some sentiments and decided on the Teeny Tiny Sentiment set which works with the word window punch I have already. This is a fabulous set which has just about any sentiment you may need for card making from Christmas to birthdays, friendship to new baby and everything in between. What I had forgotten I had ordered, were some pearls and some diamonds. Ok, so they are not real pearls and diamonds but they will add a huge amount of glam to your creations, and with Christmas coming up (yes, I know, sorry to mention it) they may well find their way onto some cards shortly. Also in my latest order was Pool Party cardstock. I love blue. It can be cool and sophisticated or warm and fun, and works well with lots of other colours. Pool Party is gorgeous, and it is funny how a colour can inspire a card. In this case, I knew I wanted to use a blue and white colour scheme. 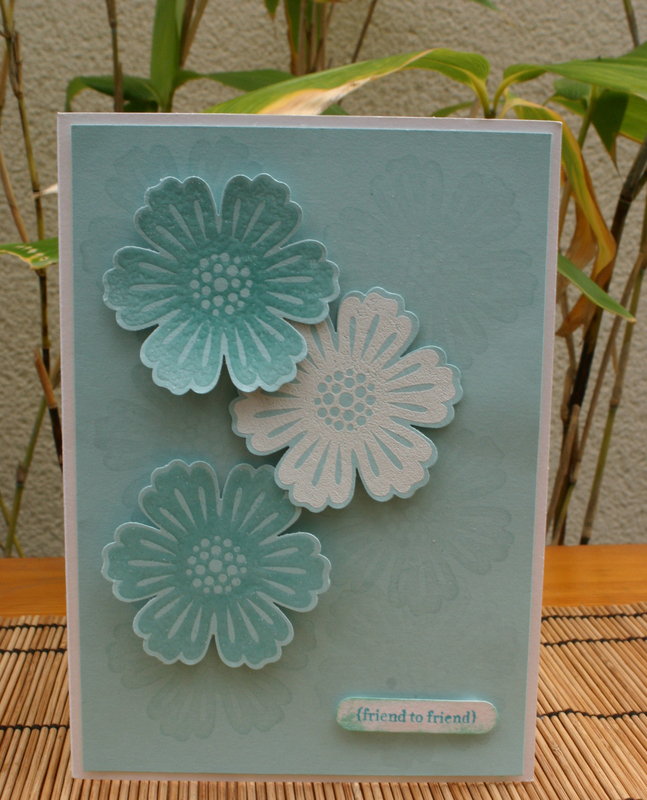 I have chosen white card which I then cut a piece of Pool Party cardstock about 1/2″ smaller all around. On to the blue I stamped a flower in Versamark ink to give a watermark effect. The flowers are stamped with Versamark and then heat embossed, one in white and one in clear. I have made this into a friendship card by using the “friend to friend” sentiment, but you can use any sentiment you like. What do you think? Don’t forget, if you want to buy any of the products I have used to make this pretty card, click on the “shop now” link on the left of my blog page, or contact me and I can do it for you.